Dani Pedrosa ended his and Honda's year-long, 18-race drought with a win at Laguna Seca. Starting behind Jorge Lorenzo, Valentino Rossi and Casey Stoner, Pedrosa swept past the men who have dominated proceedings this year to grab the holeshot and stay at the front until the flag dropped. 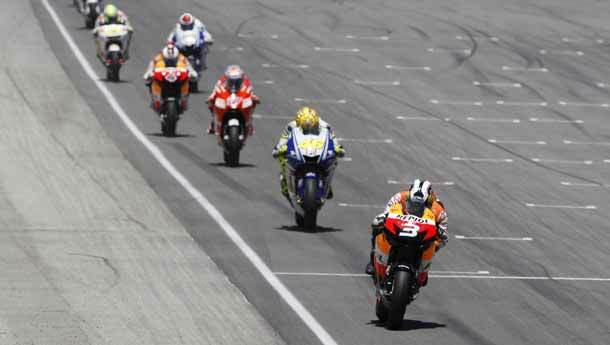 Behind him, a three-way battle for second place raged between Rossi and Stoner for the initial part of the race. But Rossi got past the Aussie rider, shortly followed by Lorenzo. Then it was the Spaniard's turn to hassle the reigning champion, but one that The Doctor would see off thanks to Lorenzo himself. In an attempt to overtake Rossi, Lorenzo outbraked himself and allowed Rossi to open up a comfortable advantage with four laps to go. However, Pedrosa decreased his pace, while Rossi had the hammer down which meant that Rossi nearly got past the Spaniard at the final corner. However, Rossi kept himself from making a risky move and seemed content with second place, while Lorenzo followed him home in third. Fourth place went to Stoner, while his team mate Nicky Hayden claimed fifth place in his home race, his best finish of the season.